How does a young builder from away break into the well-established, tight-knit local building community? Kevin Lord will tell you. Growing up in Chicopee, Massachusetts, Kevin Lord was always lucky. In fact, he earned a reputation for it. In fact, Lord’s close friendships with nearly everyone he has worked with may help explain why he is so busy (and beloved) on both sides of the river. His current projects include most of the cottages and houses on Kennebunk’s Sea Grass Lane and twenty luxury cottages in the new southern Maine resort Hidden Pond, which he is building for friend and developer Tim Harrington. Harrington is well known in Maine and Miami for his luxury, big-idea projects, and he doesn’t do many up here without help from Lord. 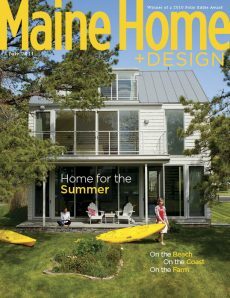 “I’ve been building in Kennebunkport for twenty years, and he’s the best builder I’ve ever worked with,” Harrington says. “He cares about the end result. There are a thousand decisions to make when you’re managing a project, and he always makes them well. He innately knows the right way to do it. He has the eyes of an artist. All that—and he’s an old soul.” In fact, the unflappable Lord is only 35 years old. Hidden Pond is but one stop on Lord’s daily rounds to his company’s various projects. On a recent morning, he drove his dusty gray pickup to an oceanfront second home to show Boston-based designer Justine Spaulding some new windows and walls. He was flexible when they decided, together, to rearrange plumbing fixtures in an upstairs bathroom, and he was sure enough to mark changes on the floor with a thick black Sharpie. He stored the remaining details in his uncanny memory. That memory comes in handy while he fields dozens of phone calls on his Blackberry about myriad works in progress. So does his great eye for proportion. “That’s what makes all of the details come together to look perfect,” he explains. With his focus on quality and relationships, Lord has loyally kept a team of top subcontractors busy, day after day, for the past eight years. “It makes my life easier,” he says. “They know the level of work we do, and I know I can count on them.” With their help, Lord can spend more time with his wife, Kelly, and two young sons, Michael and Kyle. Their teamwork makes winning work—and helping clients know what to expect—easier, too. profile_kevinlord01As soon as Lord gets a set of architectural plans, he makes ten copies of the blueprints. He distributes a copy to every subcontractor so he can provide an accurate quote based on the most detailed specs. “We can give clients a very clear price based on their exact drawings,” Lord says. “And, if I make mistakes of my own or my guys miss something, we fix it and don’t charge the client for the mistake.” That’s how he’s built his reputation for honesty and quality. Where beautifully appointed, energy-efficient new houses replace neglected old waterfront cottages, it’s a challenge to make something work well in a small footprint. But, for Lord, that’s the whole point. Built-in cabinetry, interior moldings, mahogany ship’s ladders, and other thoughtful interior details make a Maine cottage something entirely different from the houses he helped build in western Massachusetts. And the details of his charmed life—family, friends, partners, and thriving business—are what make living here so satisfying. Lucky for Lord, Mainers do, too.